The Italian fighter SAI-403 “Dardo” (Arrow) was the culmination attained for a light fighter idea, developed in Italy. A prototype of the Dardo was tested by the end of 1942. Its simple wooden construction and splendid performances were the reason why Reggia Aeronautica ordered 1000 such planes. 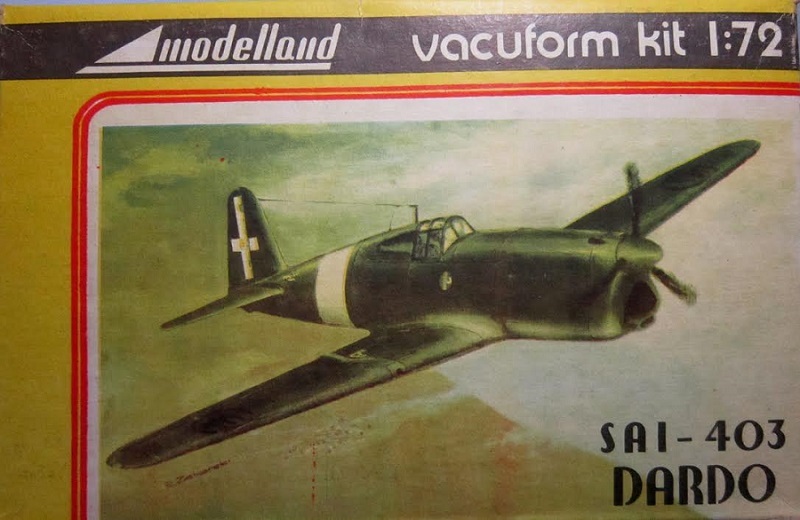 Also Germany and Japan planned to start making the Dardo in aircraft factories of Heinkel and Mitsubishi. However, the capitulation of Italy in 1943 ruined these plans. The SAI-403 was provided with an air-cooled Issota-Fraschini Delta enging of 551 kW power. It had an armament of two synchronized machine-guns of 12.7 mm and two MG 151/50 15 mm’s. Normal loaded weight: 4316 lbs. Max take-off weight: 5326 lbs. Modelland Is a model company based in Lublin, Poland. 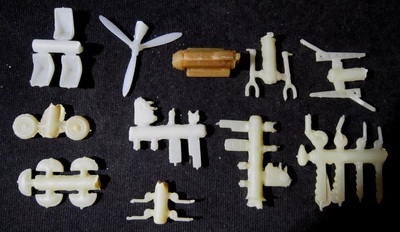 This kit is a vacuformed one. All the parts have to be cut out of solid sheets and be back-filled with putty. The kit was not shrink-wrapped. It is in an end-opening type box that has the end flaps sealed shut with Scotch tape. I am no fan of this type of box, because parts seem to find their way past the flaps to become lost. Give me a tray and lid type box any day of the week. The box art shows a Dardo flying above cloud cover. It is overall dark green above a light gray undercarriage. It has a white cross with the House of Savoy symbol on it on the rudder sides. A white fuselage band is around the fuselage. Below the windshield on the sides of the fuselage is a facist logo. Black and white Italian facist insignia is above and below the wings. One side panel of the box provides Modelland’s street address and their phone number in Lublin, Poland, followed by MADE IN POLAND. The kit contained 2 chalk white sheets of vacuformed parts, a vacuformed canopy, the decal sheet and the instructions. Nothing was cello bagged in the kit. The instructions consist of a single sheet printed on both sides. One side of the sheet begins with the history of the Dardo in Polish and English. To the right of the history is 2 parts drawings. Parts are only numbered here and not on the vacuformed sheets. Sheets are not alphabetized either. Below these is 5 exploded drawings to use for assembly. The sheet is 8 ¼” x 11 ¾” in size, folded twice to fit the small box. The other side of the instructions has a 5-view of the Dardo for just the box art scheme. A small white word is on the fuselage sides just in front of the tail and there is an L shaped information mark on the top of each wing. No unit is mentioned, because this plane only was built as one prototype. 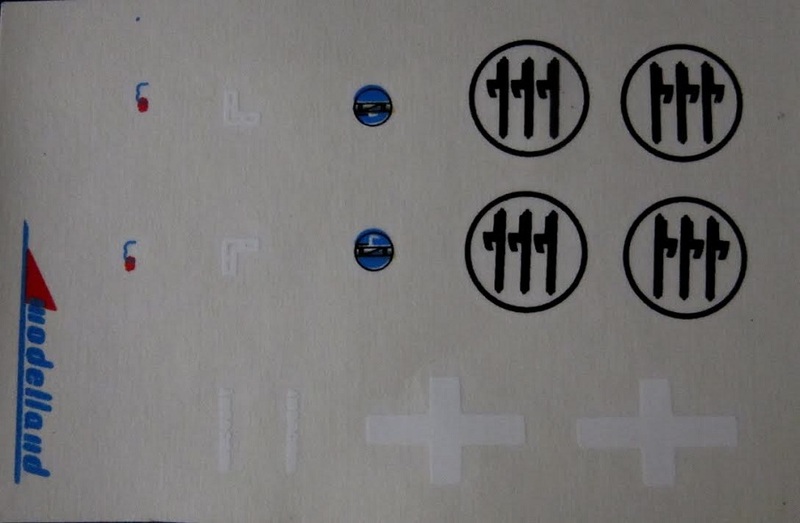 All these marks are on the decal sheet, including an all-white German cross that is NOT shown in these painting and marking instructions. The single clear canopy part completes the kits parts. 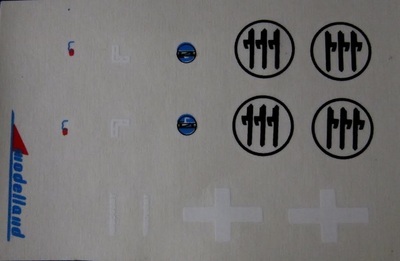 The decal sheet is the final item. My friend Jeff Roberts, who owns Roberts Models sent me resin parts to use on this kit that are superior to the vacuformed ones and saves me back-filling the vac parts, which would be a long chore to do. 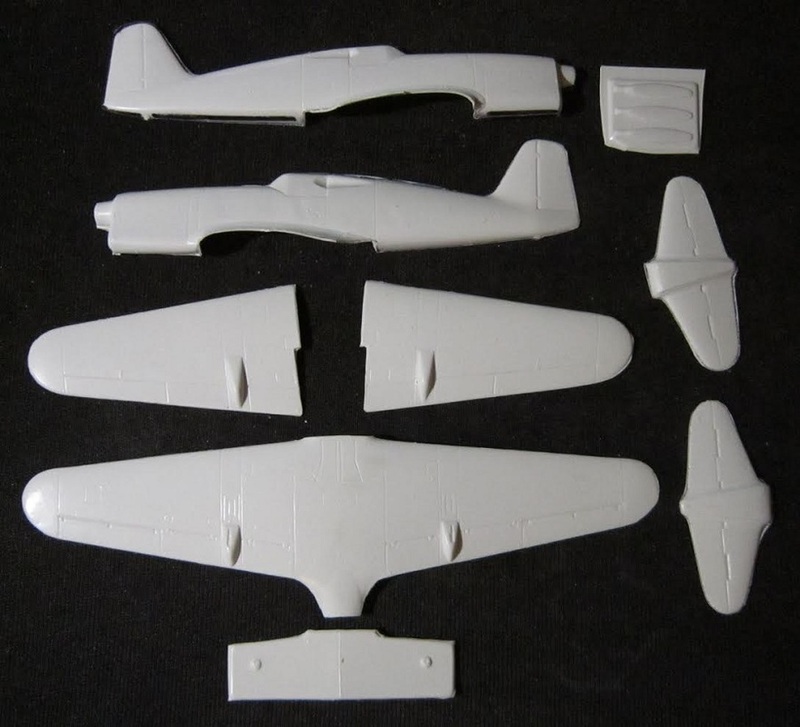 He sent me 3 bladed propellers and spinner, bucket seats, dash boards, in-line engines (2 types),engine bearers, exhaust pipes, main wheels and their struts, 5 different style tail wheels, control panels etc. Quite a haul and I thank him very much for these. This kit was a limited run kit. 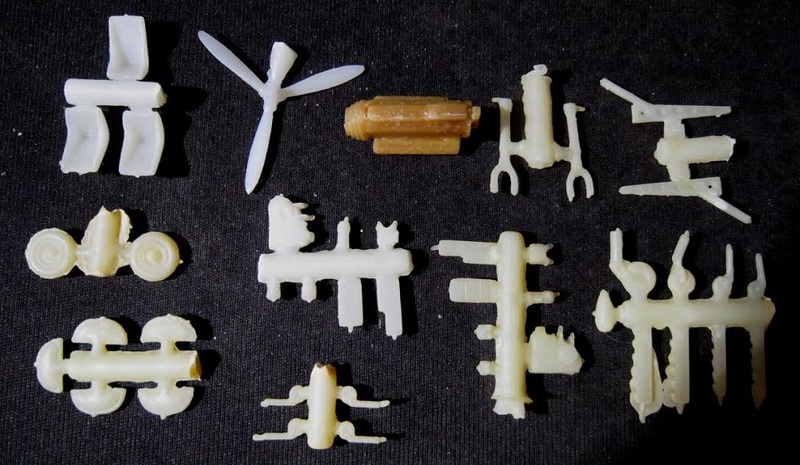 Most vacuformed kits are limited run by nature. I’m not sure if Modelland exists any more either. I got my kit by trading kits with a fellow in Kracow, Poland years ago.